In todays’ SCMP is an article on Hong Kong’s NGOs feeling isolated and confused by mainland China’s new law restricting their activities, but no one has bothered to find out why these new laws are being implemented. A little bit of research will show this new law is linked to the so-called ‘709 crackdown’ on Human Rights Lawyers, all of which was triggered by revelations of the conspiracy in Hong Kong between the National Democratic Institute (NDI) and local pan-democratic legislators which took place on 15 November 2009 to trigger the 2010 defacto civil referendum. 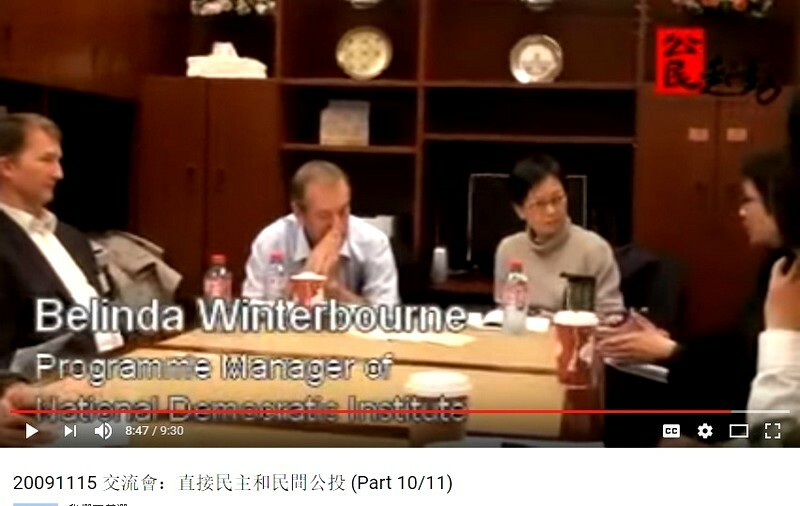 The main culprit and the person responsible for the crackdown on Human Rights lawyers and the implementation of the new NGO laws in China is Belinda Winterbourne, NDI program manager in Hong Kong from 2006 to 2012. 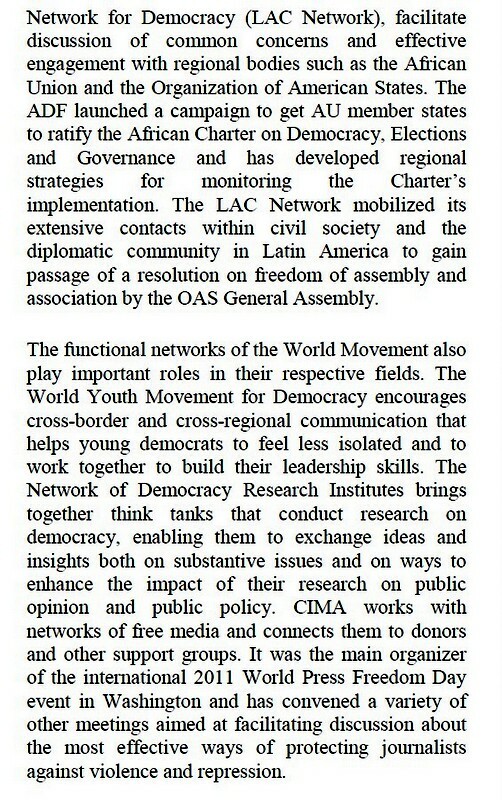 According to the article, in a study by the China Philanthropy Research Institute and China Global Philanthropy Institute, many non-governmental organisations in Hong Kong felt alienated and uncertain after the ‘Law on Management of Domestic Activities of Overseas Non-governmental Organisations’ was passed in April, under which all overseas NGOs must register with and obtain approval from the police rather than the Ministry of Civil Affairs, which their domestic counterparts must do. The requirement takes effect next year. The mainland’s adoption of the law governing overseas NGOs has sent a chill throughout the sector in Hong Kong that operates there, with some groups saying they had stopped work over the border. They said it was especially troubling the law categorised NGOs in Hong Kong, Macau and Taiwan as overseas groups, even though they were based in China. Organisations interviewed for the study said they felt mainland government agencies had undergone a change in attitude. 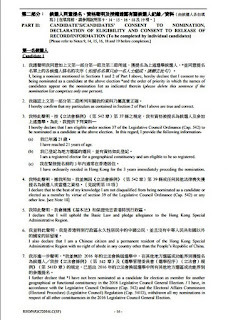 On 15 November 2009 a conspiracy took place between pan-democrat legislators and the National Democratic Institute (NDI) in Hong Kong to discuss plans to trigger the de-facto ‘referendum’ in January 2010. The conspiracy was videotaped and put on YouTube in a series of eleven short videos (Part 1/11 to Part 11/11). Christian raised the point that how much time do we have. Just now he mentioned you know ‘til January for example, but let’s say if we did want to conduct a civil referendum let’s say between now and the end of the (inaudible), how long does it usually take to educate the public on civil referendum, cos I presume that you’d have to do a lot of publicity prior to the actual exercise umm and educate them why we are doing this and you know how does that vote count eventually. The reason NGOs in Hong Kong, Macau and Taiwan are categorized as overseas groups, even though they were based in China is because the NDI has offices in Hong Kong and even though it claims to be an NGO, has illegally established itself as a company in Hong Kong. This is why the Chinese Government has categorized NGOs in Hong Kong, Macau and Taiwan as overseas groups under the Law on Management of Domestic Activities of Overseas Non-governmental Organisations. 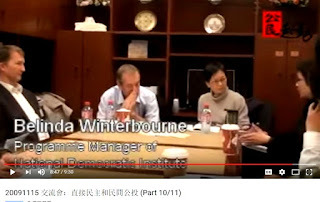 On behalf of all of the Human Rights lawyers who have been incarcerated in China and all of the NGO’s whose lives have been made a misery, let’s all say a big than you to the National Democratic Institute, with a special thanks to Belinda Winterbourne. Your stupid acts have made life a misery for thousands! And perhaps something for the NDI and its masters to consider – your stupid actions in Hong Kong have had and will continue to have far reaching consequences! 4. Solidarity Center (previously known as the Free Trade Union Institute, then American Center for International Labor Solidarity (ACILS)), representing the labor sector. To be on the safe side, you need to check your donor list to make sure none of these institutes are, or have been donors of yours. You also need to check with all of your local and overseas donors to make sure none of them has any connections with, has contributed funds to, or is being funded by any of them. 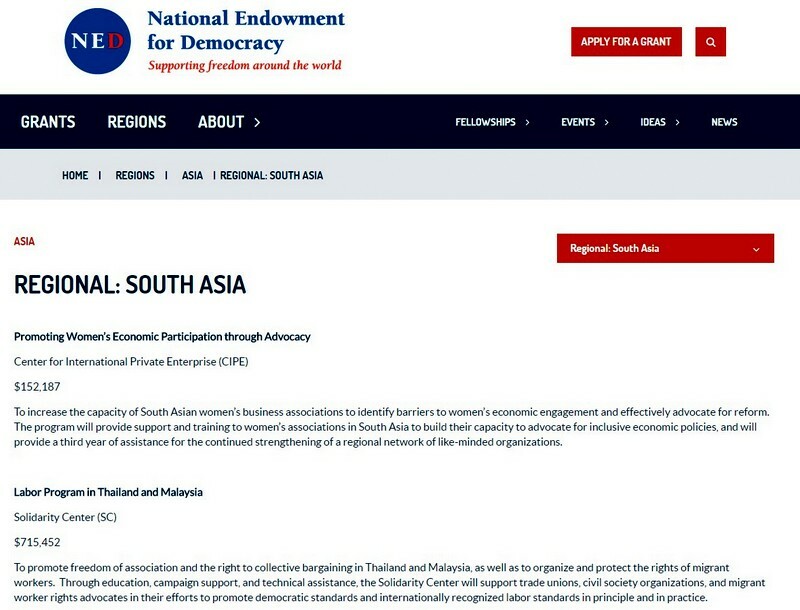 If you are receiving money from any of these institutes, you will fall foul of the new law, because the NED is funding activities to destabilize China in an attempt to contain its growing influence and if you are in any way connected to them, you will be considered a ‘subversive organisation’. Belinda Winterbourne. Vic Perton on Flickr. 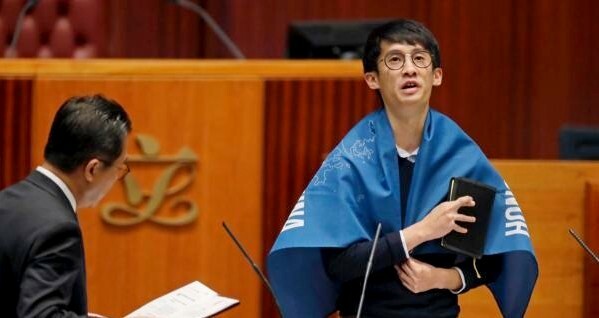 When Sixtus LEUNG Chung-hang and YAU Wai-ching were taking their oath of office in LegCo on 12 October 2016 they both committed the offence of making a False Declaration under Section 103 of the Electoral Affairs Commission (Electoral Procedure) (Legislative Council) Regulation, CAP 541D. There should be no discussion about what they have done is right or wrong. They should be arrested, charged and prosecuted. (1). 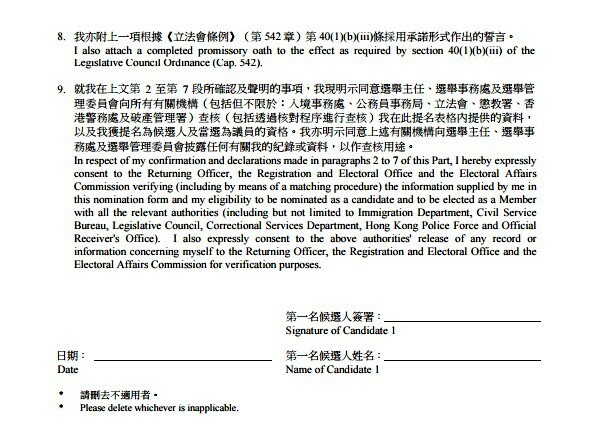 YAU Wai-ching and LEUNG Chung-hang were recently nominated as candidates in the 2016 Legislative Council General Elections. (2). As part of this nomination procedure each of them had to complete a Nomination Form under Electoral Affairs Commission (Electoral Procedure) (Legislative Council) Regulation Cap. 541D. 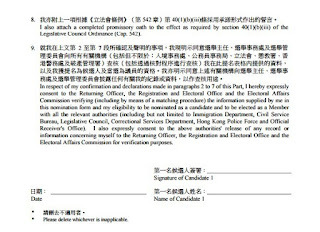 This nomination form includes at Part II a Statutory Declaration of Eligibility. 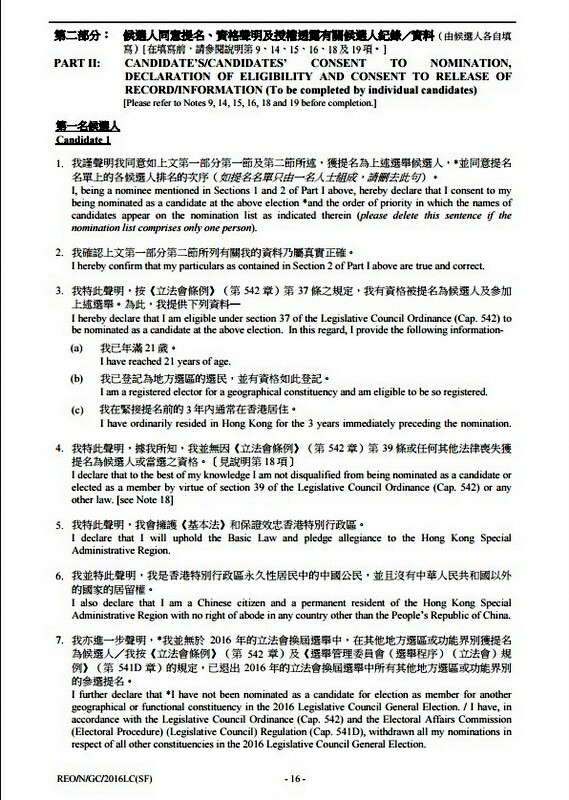 I declare that I will uphold the Basic Law and pledge allegiance to the Hong Kong Special Administrative Region. (3). 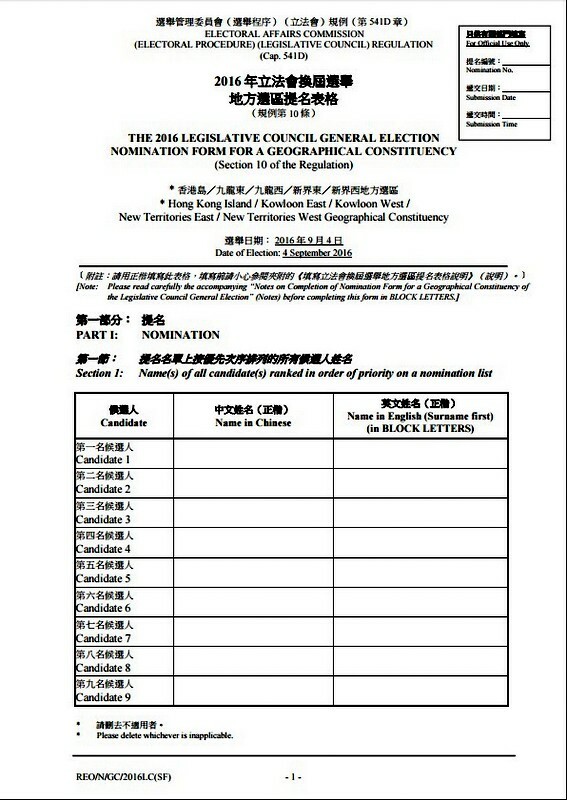 To be eligible as a candidate in the 2016 LegCo elections this section had to be completed and signed by ‘individual candidates’. (4). Article 1 of the Basic Law states: The Hong Kong Special Administrative Region is an inalienable part of the People's Republic of China whilst Article 12 of the Basic Law states: The Hong Kong Special Administrative Region shall be a local administrative region of the People's Republic of China, which shall enjoy a high degree of autonomy and come directly under the Central People's Government. (5). At the first meeting of the 2016 Legislative Council on 12 October 2016, all newly elected candidates were required to take the Legislative Council Oath of Office. 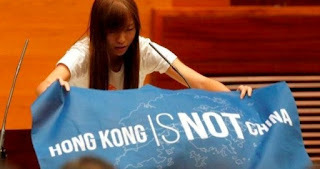 On this occasion, both YAU Wai-ching and LEUNG Chung-hang displayed banners which read ‘Hong Kong IS NOT China’. This is a clear violation of the Basic Law! (6). Whilst Article 77 of the Basic Law states: ‘Members of the Legislative Council of the Hong Kong Special Administrative Region shall be immune from legal action in respect of their statements at meetings of the Council’, displaying these banners in this way is an action, not a statement and as recently demonstrated by the prosecution of Raymond WONG Yuk-man for assault in the Legislative Council chamber, LegCo members are not immune from prosecution for their actions in Legislative Council meetings. The display of these banners is unequivocal evidence that when YAU Wai-ching and LEUNG Chung-han signed in their Statutory Declaration of Eligibility they would uphold the Basic Law, this was a statement which they knew to be false in a material particular in an election related document under Section 103 of the Electoral Affairs Commission (Electoral Procedure) (Legislative Council) Regulation, CAP 541D. 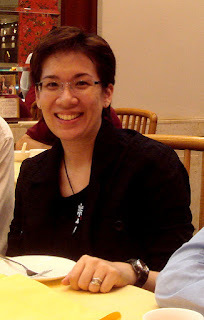 Sixtus LEUNG Chung-hang and YAU Wai-ching have committed a crime. They should be arrested, charged and prosecuted. (1) A person who, in an election related document, makes a statement which that person knows to be false in a material particular or recklessly makes a statement which is incorrect in a material particular or knowingly omits a material particular from an election related document commits an offence. 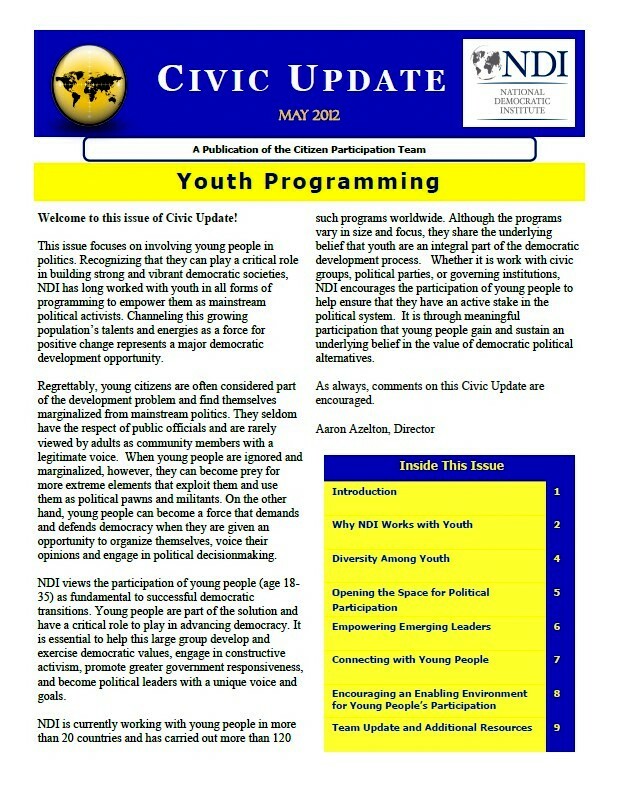 (2) A person who directly or indirectly by himself or herself or by another person on his or her behalf conspires with, incites, compels, induces, coerces, intimidates or persuades another person to make a false statement in an election related document or to provide information which that person knows to be wrong in a material particular in an election related document commits an offence. (3) A person who commits an offence under this section is liable to a fine at level 2 and to imprisonment for 6 months. 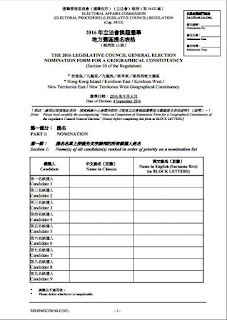 (4) In this section election related document (與選舉有關的文件) means a form, declaration, application, authorization, notice, statement or a nomination form required or used for the purposes of this Regulation. Following Joshua WONG’s deportation from Thailand he wants to know why he was blacklisted and which other countries he is likely to be blacklisted in. 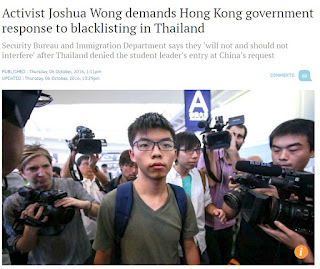 Why was Joshua WONG blacklisted and deported from Thailand? Almost every year since 1983 the US Congress has allocated US Government funds to the National Endowment for Democracy (NED) to ‘strengthen democracy’ around the world. 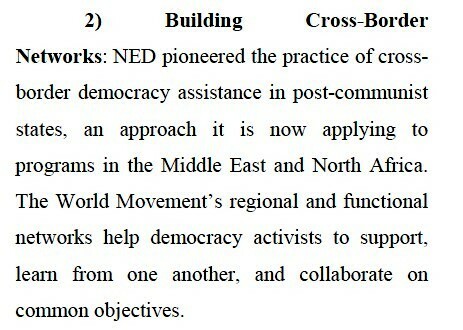 One of the ways the NED does this is through mounting ‘color revolutions’ to topple legitimate governments and replace them with US subservient systems. 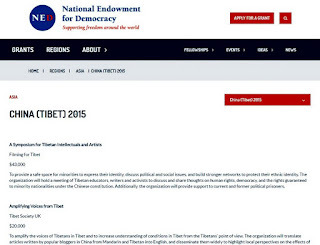 Every country in Asia is now aware of the chaos caused by the NED organized Middle East – North Africa (MENA) color revolutions and as a result, now appreciate the threat that NED activities pose in their own countries. They are also aware the Occupy Central protests/Umbrella Movement was a failed color revolution mounted in Hong Kong by the National Democratic Institute (NDI). 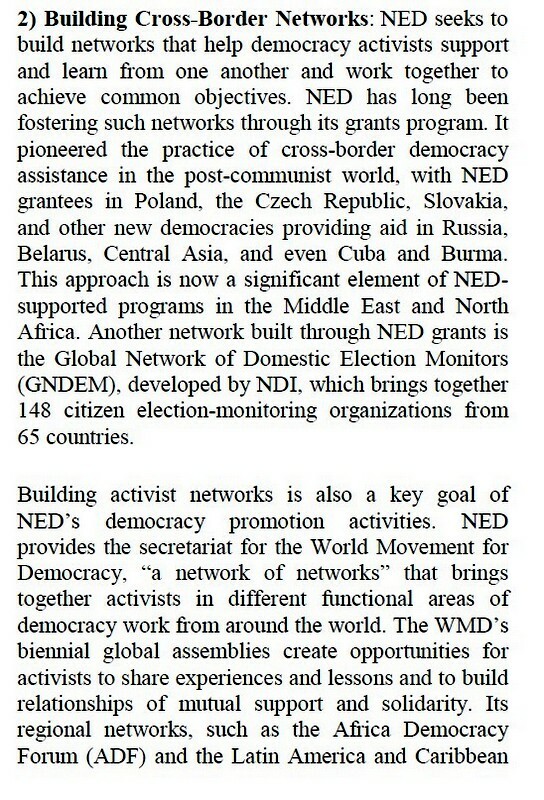 The NDI is the Democratic Party wing of the NED and one of the NED’s four core grantees, so because the NED are still funding activities in Hong Kong, almost every country in Asia is watching things here closely. Joshua WONG is an NED puppet and the willing face of the NED color revolution in Hong Kong. 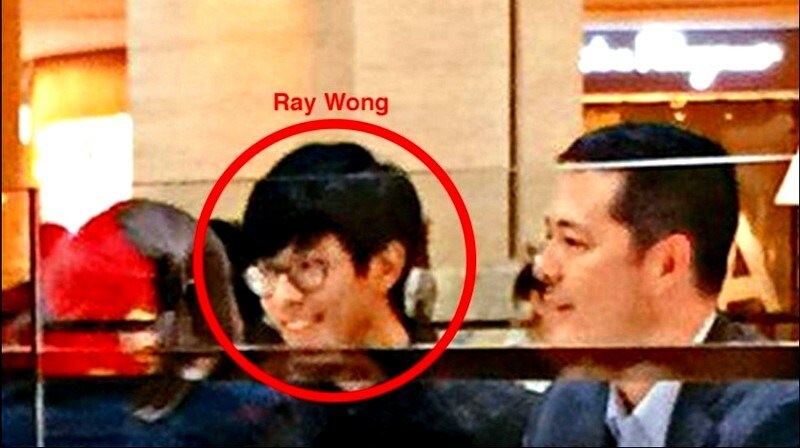 What threat does Joshua WONG pose to Thailand? 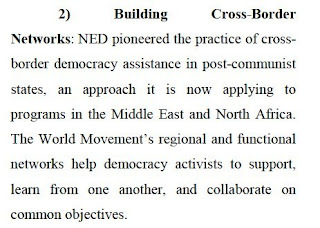 In the NED 2012 Strategy Document, one of the NED’s key goals is building cross-border networks of democracy activists, of whom youth are a key component. Joshua WONG is a component in this NED cross-border activist network in Asia. 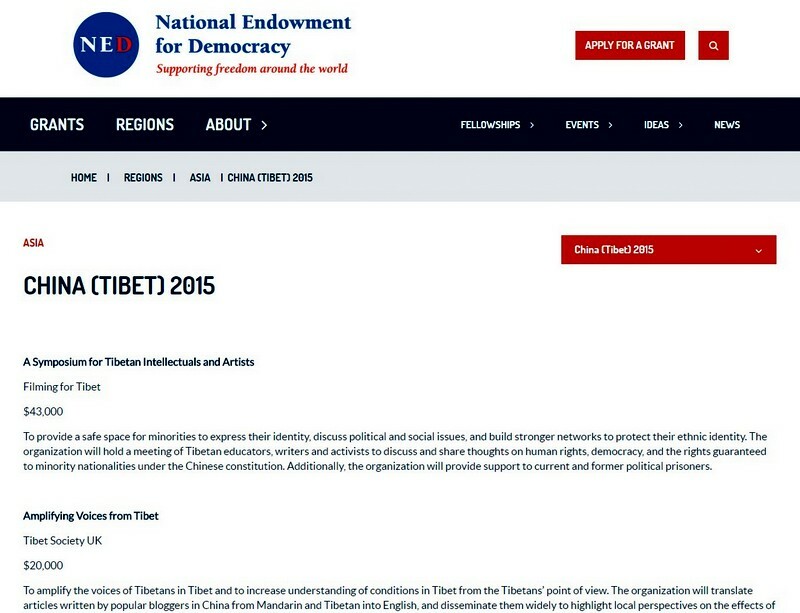 The issue is, Asian leaders have seen how the NED has destabilized nations across the world with their color revolutions, so they will quite rightly take all legitimate means to ensure their countries are not next on the list. “National Democratic Institute for International Affairs - US$460,000 - To foster awareness regarding Hong Kong's political institutions and constitutional reform process and to develop the capacity of citizens - particularly university students - to more effectively participate in the public debate on political reform, NDI will work with civil society organizations on parliamentary monitoring, a survey, and development of an Internet portal, allowing students and citizens to explore possible reforms leading to universal suffrage”. Joshua WONG was deported from Malaysia on 26 May 2015 after trying to meet up with Malaysian activists. 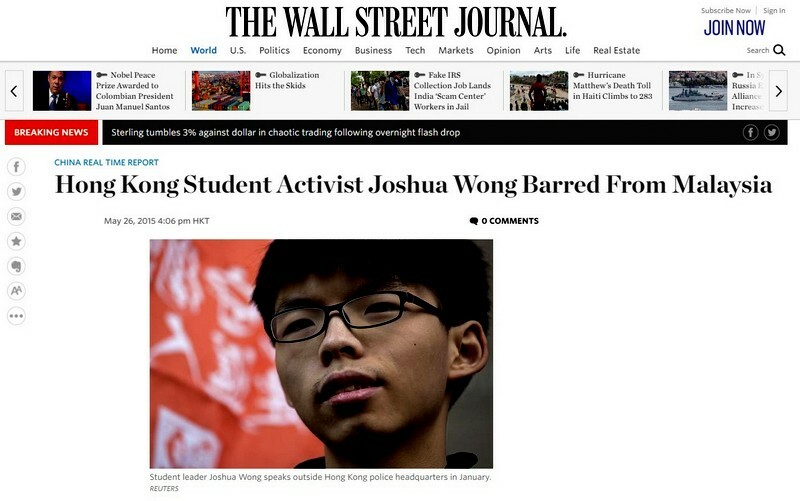 Which other countries is Joshua WONG likely to be blacklisted in? The answer to this is actually quite simple – just check out the NED website and find out where else they are funding activities in Asia. 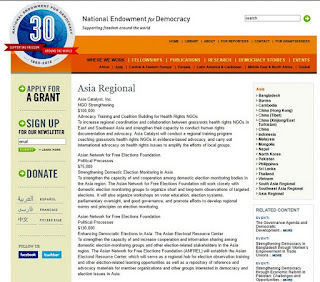 The NED also fund programs through their grants to Asia and South Asia. 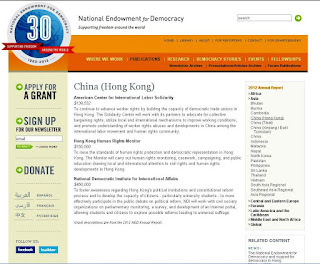 Some of the recent grants to Hong Kong are 'hidden' in here. This is just the list of grantees in 2015. The NED are funding programs in other countries which did not receive grants in 2015. Rather than bother the Hong Kong Government, we recommend Joshua WONG and all of his student activist friends check with their American handlers before making any future travel arrangements. They after all are the people with the most up-to-date information on where the NED are funding subversive activities and more importantly, which country is next in line for a color revolution. 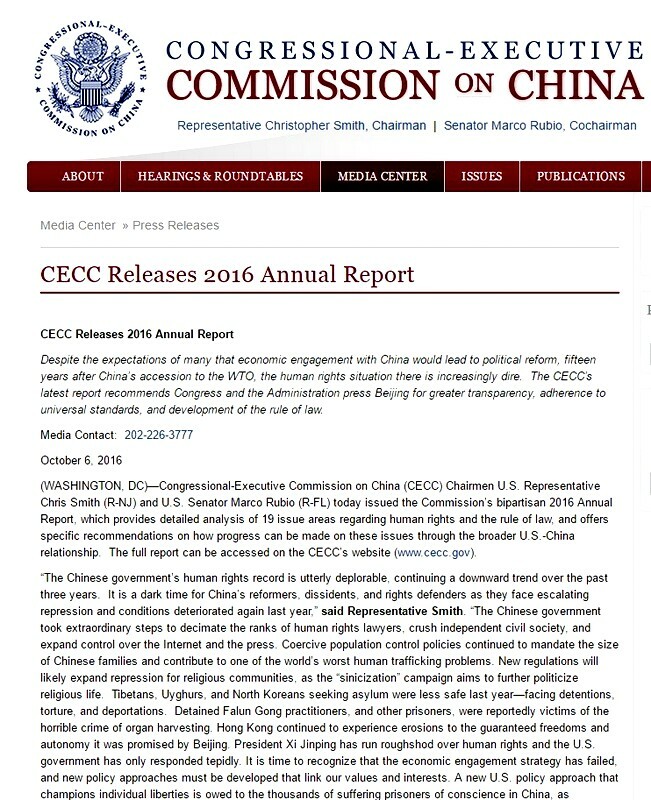 The Congressional-Executive Commission on China (CECC) was created by Congress in October 2000 with the legislative mandate to monitor human rights and the development of the rule of law in China, and to submit an annual report to the President and the Congress. The CECC consists of nine Senators, nine Members of the House of Representatives, and five senior Administration officials appointed by the President. The Chairman of the CECC is Representative Christopher Smith (Chris Smith). 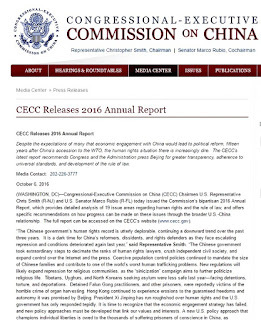 The CECC has just released its annual report for 2016, which includes a section on Hong Kong in an open letter to President Obama. The actions of the Chinese and Hong Kong governments during the past reporting year continue to raise concerns about the future of the guaranteed freedoms, autonomy, and rule of law that distinguish Hong Kong from mainland China and underpin Hong Kong’s financial reputation and prosperity. 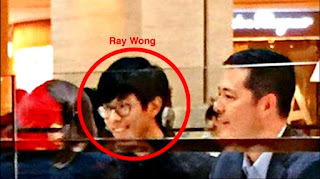 The disappearance, alleged abductions, and detention in mainland China of five Hong Kong-based booksellers is one of the most grave violations of the “One Country, Two Systems” policy since 1997. Given the important economic interests the United States has in Hong Kong, and China’s international commitments to protect a “high degree of autonomy” in Hong Kong, the Commission’s report recommends that the administration continue to issue annually the report on Hong Kong outlined in Section 301 of the United States-Hong Kong Policy Act of 1992. In addition, the report recommends that the Administration and Congress work together to determine whether separate treatment for Hong Kong, which is allowed under the Act, is merited if Hong Kong’s autonomy and its guaranteed freedoms are further eroded. The report talks about “Principled U.S. leadership”, so this post challenges Chris Smith to tell the President and the people of Hong Kong the truth about what the US Government, through the National Endowment for Democracy (NED) is doing in Hong Kong. 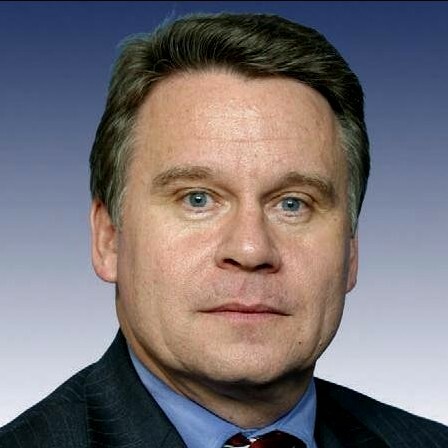 ‘Representative Chris Smith Calls NED Most Cost-Effective Item in Budget - Washington, D.C. - Congressman Christopher Smith (R-N.J.) praised the work of the National Endowment for Democracy (NED), calling NED "the most cost-effective item in the federal budget." Smith, who chairs the House Subcommittee on International Operations and Human Rights called attention to the Endowment's efficiency and effectiveness in promoting democracy around the world at a hearing of his subcommittee yesterday’. 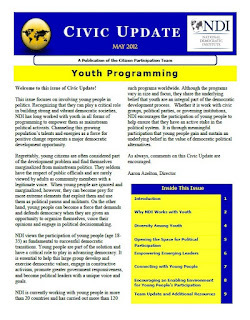 This shows Chris Smith is fully aware of what the NED is and what they are doing. 2. Were the Hong Kong ‘booksellers’ funded by the NED? Many of the grant recipients are publishers. We would like to know if the Hong Kong ‘booksellers’ are among the publishers who were being funded by the NED? As an aside, perhaps Chris Smith could also brief the President on how many of the lawyers caught up in the so-called 709 crackdown are NED funded. 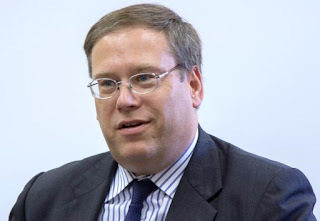 At the same time, it might be a good time for Chris Smith to explain to the American public exactly how their tax payer dollars are being squandered on failed programs in China. 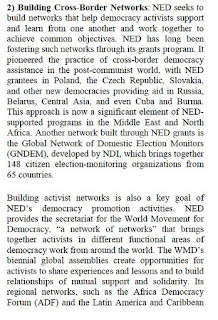 National Democratic Institute for International Affairs - US$460,000 - To foster awareness regarding Hong Kong's political institutions and constitutional reform process and to develop the capacity of citizens - particularly university students - to more effectively participate in the public debate on political reform, NDI will work with civil society organizations on parliamentary monitoring, a survey, and development of an Internet portal, allowing students and citizens to explore possible reforms leading to universal suffrage. 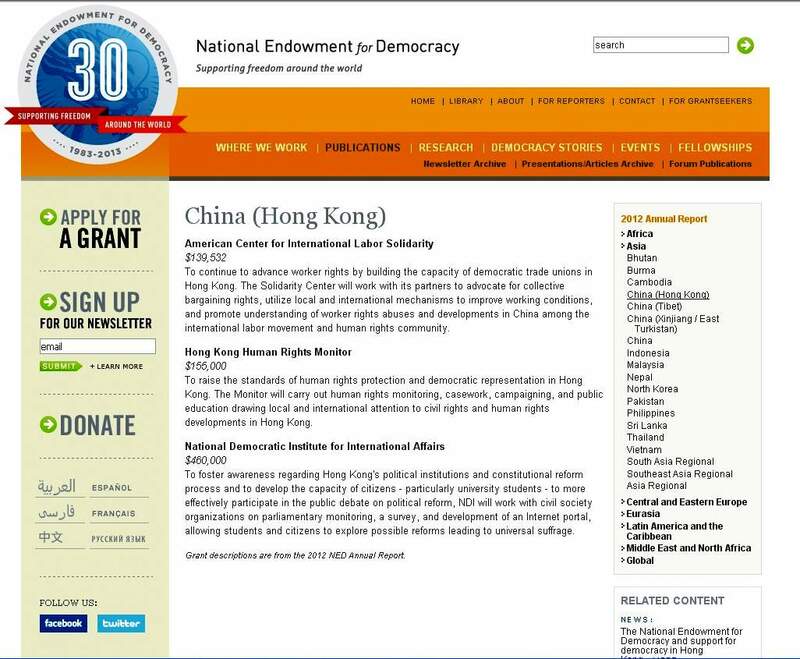 This is the US Government grant which was used to fund Hong Kong's color revolution (Occupy Central/Umbrella Movement). 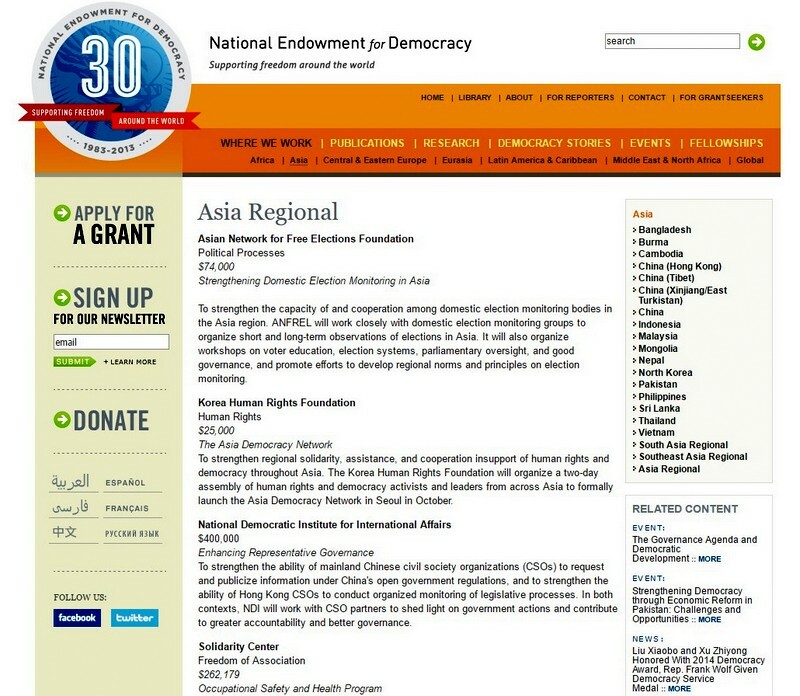 National Democratic Institute for International Affairs - $400,000 - Enhancing Representative Governance - To strengthen the ability of mainland Chinese civil society organizations (CSOs) to request and publicize information under China's open government regulations, and to strengthen the ability of Hong Kong CSOs to conduct organized monitoring of legislative processes. In both contexts, NDI will work with CSO partners to shed light on government actions and contribute to greater accountability and better governance. National Democratic Institute for International Affairs - Political Processes - $410,000 - Amplifying Citizens’ Voices in Hong Kong & China - To engage Hong Kong civic and political sectors in substantive dialogue around governance and electoral reform processes and to provide civic education for Chinese activists. 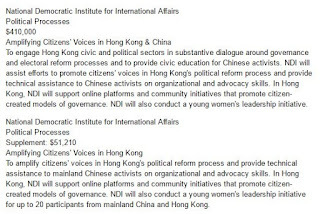 NDI will assist efforts to promote citizens’ voices in Hong Kong’s political reform process and provide technical assistance to Chinese activists on organizational and advocacy skills. In Hong Kong, NDI will support online platforms and community initiatives that promote citizen-created models of governance. NDI will also conduct a young women’s leadership initiative. 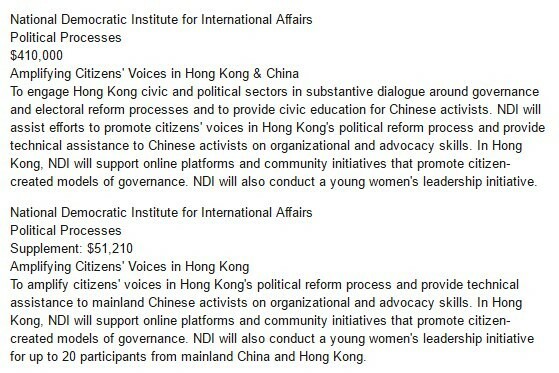 National Democratic Institute for International Affairs - Political Processes - Supplement: $51,210 - Amplifying Citizens’ Voices in Hong Kong - To amplify citizens’ voices in Hong Kong’s political reform process and provide technical assistance to mainland Chinese activists on organizational and advocacy skills. 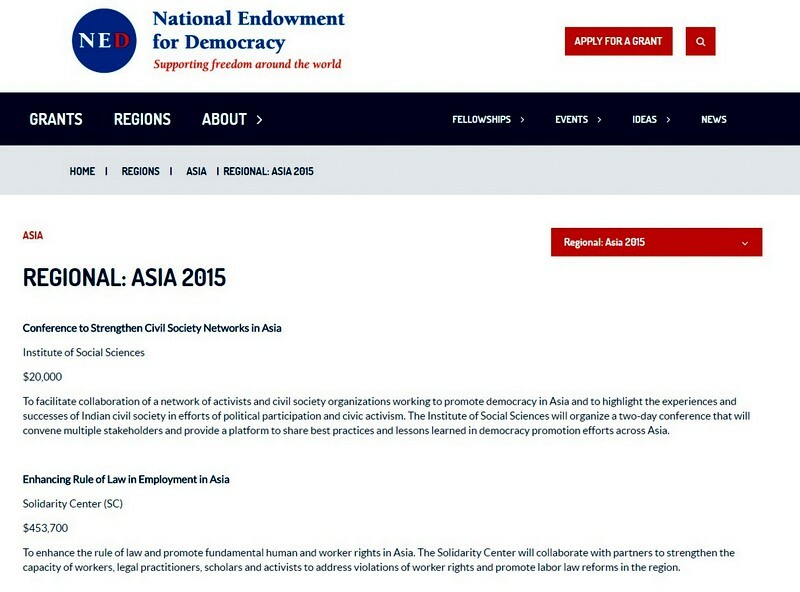 In Hong Kong, NDI will support online platforms and community initiatives that promote citizen-created models of governance. NDI will also conduct a young women’s leadership initiative for up to 20 participants from mainland China and Hong Kong. 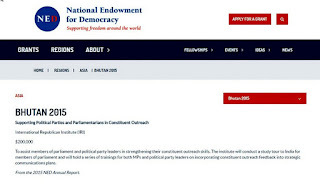 National Democratic Institute for International Affairs (NDI) - Promoting Public Dialogue on Political Reform in Hong Kong and China - $343,750 - To promote public dialogue on political reform in Hong Kong and China. The institute will conduct an expert assessment mission to Hong Kong and draft a report for public dissemination and distribution to the diplomatic community, policymakers, and the media. The institute will invite international scholars and experts to conduct public seminars on comparative models of governance, and will also host workshops on legal advocacy to enable victims of violence to pursue protection, compensation, and justice. Finally, we would like Chris Smith to explain to both the President and the people of Hong Kong how the US Congress can allocate US Government funds to the NED for work in Hong Kong and China and he can sit as Chair of a Congressional Commission commenting on Hong Kong and China and yet does not declare a Conflict of Interest in his role and his Commission makes no mention of the NED or its funding. The reason for raising this is because, if this is what US Democracy really means, you can keep it. Get out of Hong Kong, stop interfering in Hong Kong’s internal affairs and leave us to settle our own affairs through the high degree of autonomy that China has been so graceful to bestow upon us! We don’t need your interference. Through your stupid meddling, America has cost Hong Kong its political future, so get out and leave us alone, because until you stop meddling, there will be no trust between Hong Kong and Beijing and we will never be able to make any progress on political reform. Open Letter to US Consul-General Kurt Tong – when are you going to tell the truth about what the NED are doing in Hong Kong? "'one country, two systems' is not only a very unique and special reality. It is also a construct that both China's central government and the people of Hong Kong -- and for that matter, the United States as well -- all aim to maintain”. “the United States and the people of Hong Kong share an abiding respect for certain fundamental freedoms, and certain core values”. We believe as a people our shared core values include commitments to honesty and integrity and a desire for open, transparent and accountable government. Your predecessor Mr. Clifford Hart was not an honest man. He suppressed the truth about what your government is doing in Hong Kong, not only from the Hong Kong people, but also from your president. Question 1. What was the US$460,000 given by the NED to support Occupy Central spent on? “To foster awareness regarding Hong Kong's political institutions and constitutional reform process and to develop the capacity of citizens - particularly university students - to more effectively participate in the public debate on political reform, NDI will work with civil society organizations on parliamentary monitoring, a survey, and development of an Internet portal, allowing students and citizens to explore possible reforms leading to universal suffrage”. Can you explain to the Hong Kong people what this money was spent on, and specifically, which university students were the subjects of your program and what was their role in the Occupy Central Protests/Umbrella movement? Question 2. What was the US$461,210 given by the NED to amplify citizen’s voices in Hong Kong spent on? 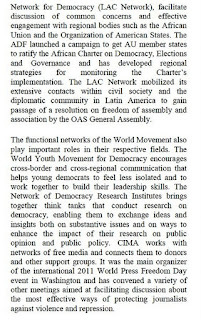 “Political Processes - US$410,000 - Amplifying Citizens’ Voices in Hong Kong & China - To engage Hong Kong civic and political sectors in substantive dialogue around governance and electoral reform processes and to provide civic education for Chinese activists. 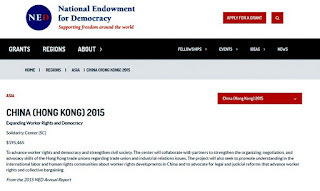 NDI will assist efforts to promote citizens’ voices in Hong Kong’s political reform process and provide technical assistance to Chinese activists on organizational and advocacy skills. In Hong Kong, NDI will support online platforms and community initiatives that promote citizen-created models of governance. NDI will also conduct a young women’s leadership initiative”. “Political Processes - Supplement: US$51,210 - Amplifying Citizens’ Voices in Hong Kong - To amplify citizens’ voices in Hong Kong’s political reform process and provide technical assistance to mainland Chinese activists on organizational and advocacy skills. In Hong Kong, NDI will support online platforms and community initiatives that promote citizen-created models of governance. 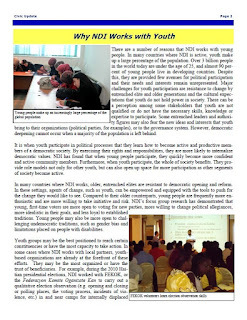 NDI will also conduct a young women’s leadership initiative for up to 20 participants from mainland China and Hong Kong”. Can you explain to the Hong Kong people what this money was spent on? 3. Is the US Government funding the independence movement in Hong Kong? 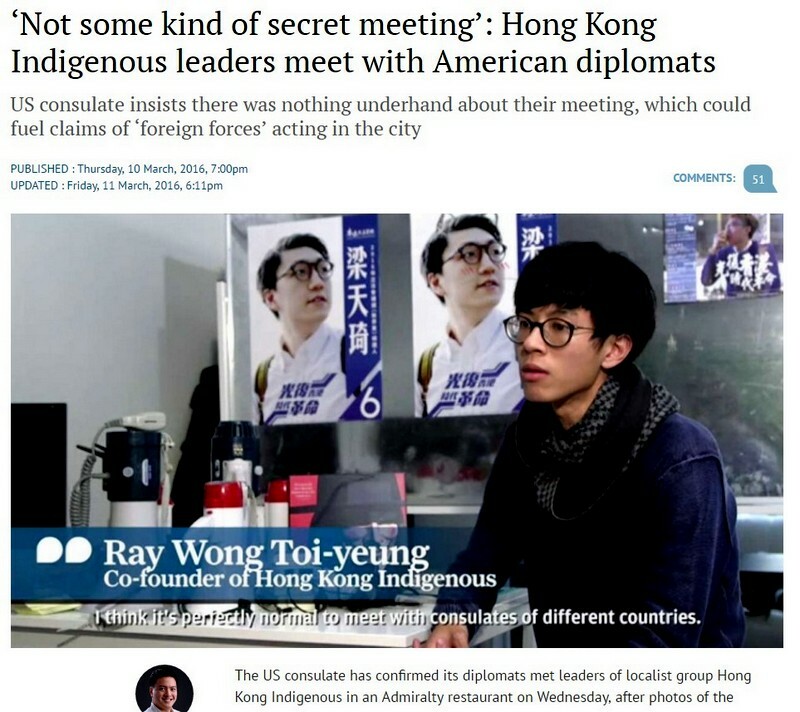 In March 2016, your staff held a secret meeting with leaders of localist group Hong Kong Indigenous, including Edward Leung Tin-kei and Ray Wong Toi-yeung. Your predecessor Gary Hart refused to disclose the truth about this meeting. What we want to know, on behalf of the Hong Kong people is this - is the American government funding the Hong Kong independence movement? After you have answered these questions, you might wish to explain to the American public how their taxpayer dollars are being spent, because using American Government funds the NED has worked incessantly to undermine and destabilize Hong Kong, making it almost ungovernable. To achieve your government's goals, the NED has bribed our politicians, corrupted our institutions and attacked the very fabric of our society, including using school children to fight your battles, so if your claim that America aims to maintain the ‘one country, two systems’ is true, then Hong Kong’s enemy and the evil you need to confront is the NED, so the solutions to Hong Kong’s problems lie not in Hong Kong or China, but in reforming your own government. 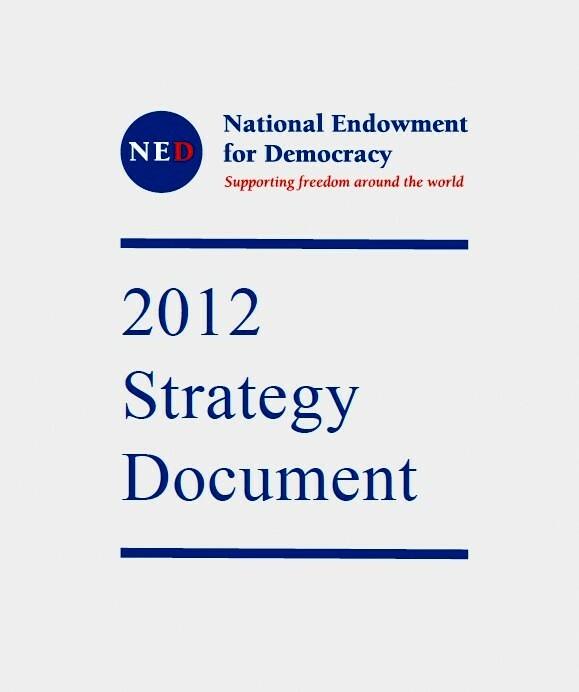 National Endowment for Democracy (NED) Annual Report 2012. 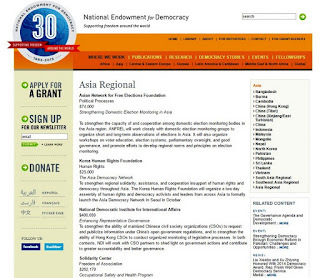 Grants to Asia – China (Hong Kong) in 2012. 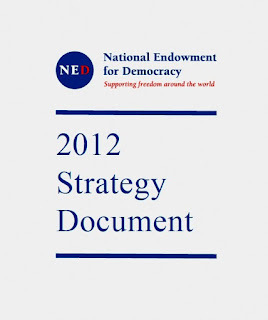 National Endowment for Democracy (NED) Annual Report 2014. 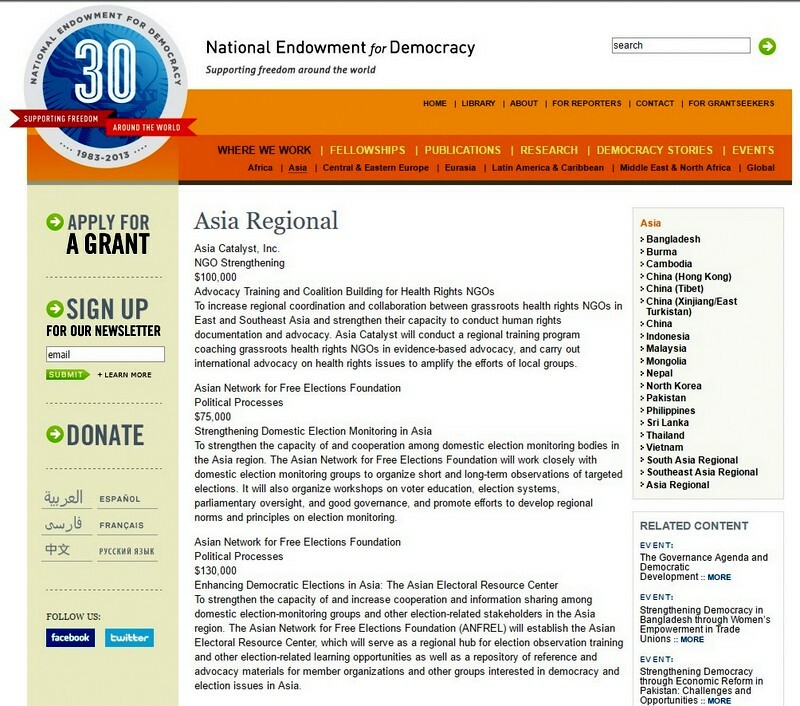 Grants to Asia – Asia Regional. Hong Kong in 2014.